Yogurt containers are great for gardening! You can start seeds there in the spring before transplanting them into your garden. Poke a few holes in the bottom for drainage, and plant some seeds! After you've replanted them, save the containers because you can use them again next year. 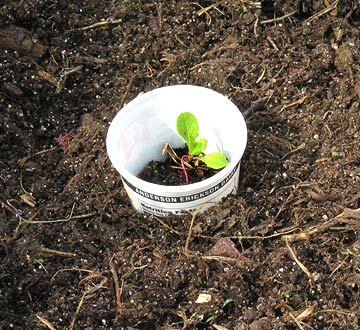 Another way that yogurt containers are useful for gardening is that they make great scoops for scooping up soil, fertilizer, or compost. You can also use yogurt containers as cutworm collars, like so. For those big yogurt containers, you can also do some container gardening in them, especially for herbs. You and your kids can do arts and crafts with them. All you need is some glue, construction paper, glitter, sequins, or whatever you want to turn those containers into anything -- from pencil cups to Christmas ornaments. Organize your house with them. One for paper clips, one for pencils, etc. in your office. They're also the perfect size for organizing craft supplies and for organizing things like screws and nails. You can also use them in place of Tupperware containers, if they're the kinds with lids as opposed to foil. Store your leftovers in them or bring your lunch to work in them. My grandmother used to save them for drinking cups! Plastic #5 does not contain BPA and is not thought to leach chemicals when heated, but I would personally still err on the side of caution and not microwave a yogurt container or put anything hot into it. That's definitely another great way to reuse yogurt cups.